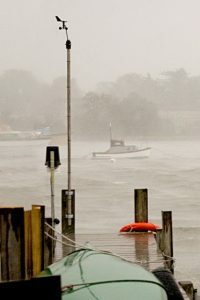 The wind is measured by a cup anemometer and wind vane mounted on a 4m pole at the end of the jetty. The photo shows the installation on a stormy day! If the wind direction is from east through south to around west-southwest the anemometer and wind vane are reasonably exposed. Around a west direction you start to see the effect of a nearby block of flats (“Quay 2000”). For more northerly wind directions the houses along Priory Road cause the wind to be gusty in speed and direction and the measured wind will be significantly lower than the true value. The wind speeds are displayed in m/s because that is the scientific unit for measuring the wind …and having spent my career doing that I’m too old to change! For knots multiply the m/s value by 2. For miles/hour you need to add a further 15%. The table shows my version of the Beaufort Scale – click on it to enlarge. The description refers to what it’s like sailing my Seafly dinghy! Anemometer Exposure: The anemometer is on a pole 4.35m above the jetty decking which itself is about 4.8m above chart datum. 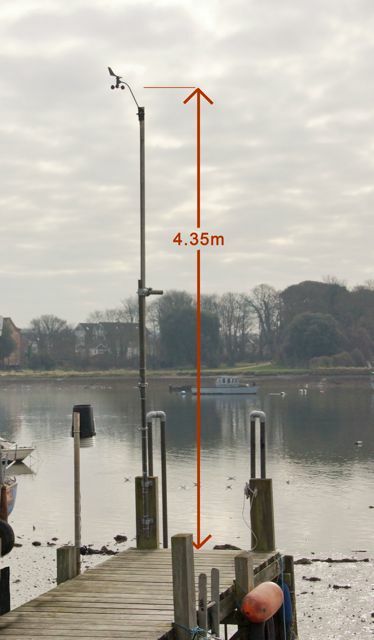 This implies an anemometer height which varies between about 7.2m above the mud at low tide and about 4.4m above water at the highest spring tides (the maximum tidal range is about 5m). The fetch (see panorama below) varies from about 0.6km to the SSW to 0.24km to the south, but is restricted to the north by houses, the closest being about 30m away. 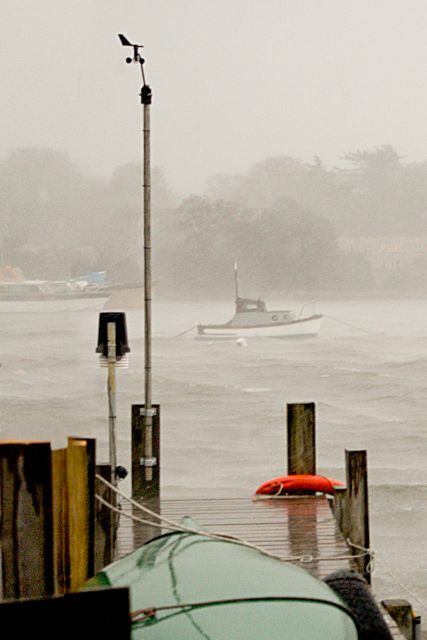 The roof of the blue windowed shed at the shore end of the jetty is about 2m below the anemometer height. The fetch to the east is about 0.4km but there are many obstructions. 360° Panorama: These photos show the tide out and most of the way in. The central post bisecting the photos is the anemometer pole.